The Westin Osaka is a luxury hotel in north Umeda with the highest standards of deluxe comfort, courteous and professional service, and excellent amenities. The hotel’s facilities include its own shops, restaurants, a fitness gym, an indoor swimming pool, and an acupuncture salon. 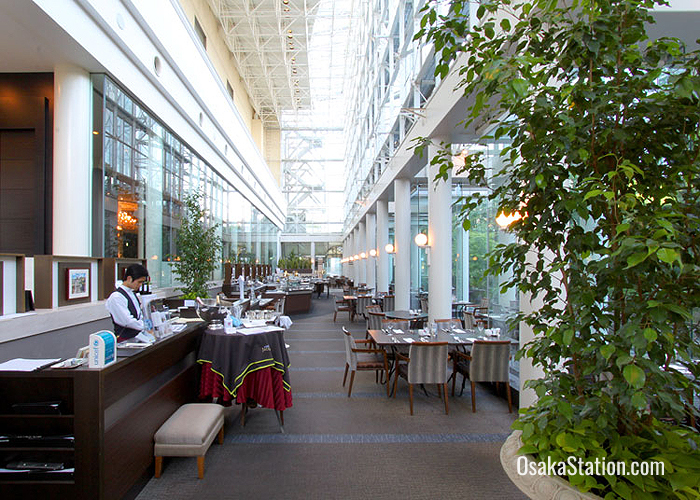 With the Umeda Sky Building on the doorstep, and Osaka Station just a short distance away, this hotel is convenient for both recreation and public transport. 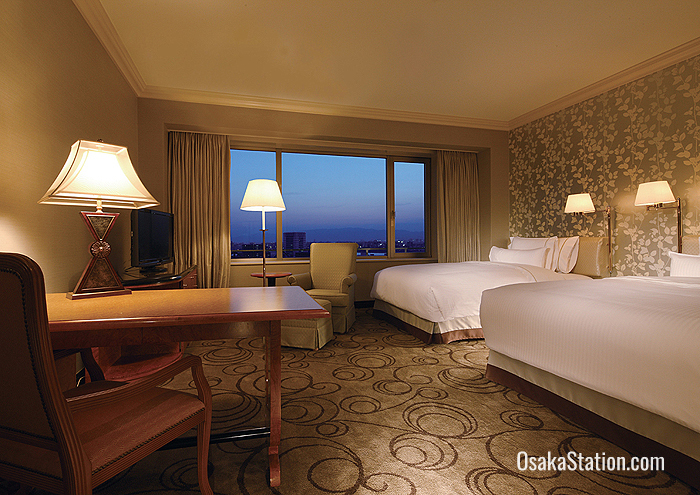 The Westin Osaka has doubles, twins, executive rooms, and luxury suites. All the Westin Osaka’s guest rooms have a floor space of over 41 square meters, large windows from which to enjoy panoramic views, and elegant interiors decorated in both Asian and European styles. Beds are fitted with the Heavenly Bed brand of deluxe bedding with soft fluffy pillows and are said to feel like sleeping on clouds. All rooms have individual air conditioning and come with the following facilities: LAN cable high speed internet connections, free Wi-Fi, a refrigerator, a minibar, an electric kettle, a writing desk, nightwear, slippers, and a radio. The marble bathrooms have large bathtubs and separate shower booths, plus a toilet with a bidet, and are supplied with towels, a bathrobe, an ion hair dryer, shampoo, conditioner, body lotion, body wash, toothbrushes, soap, hairbrushes, and razors. There is also a ladies only floor with rooms especially appointed for lady travelers. These have extra facilities such as facial steamers, humidifiers, air purifiers, and makeup and cleansing amenities. Wheelchair accessible rooms are also available. 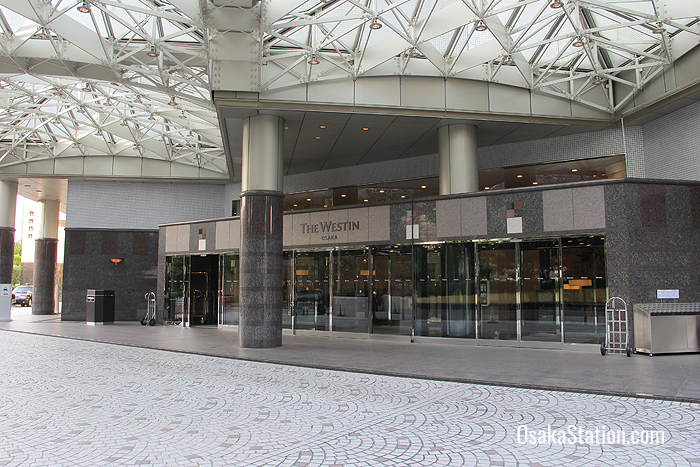 The Westin Osaka has three restaurants, a bar, and a lobby lounge café. Breakfast is served in restaurant Amadeus from 6.30 – 10.30 daily. A variety of breakfast options are on offer at different prices. These include the standard buffet breakfast 3,400 yen (1,700 yen for children), the American buffet breakfast with plenty of ham and eggs for 2,900 yen, or the Continental buffet breakfast with plenty of bread and pastries for 2,300 yen. A la carte breakfasts are also possible. Below are the details of all the dining facilities. Amadeus is a casual Mediterranean style buffet restaurant with an open kitchen. 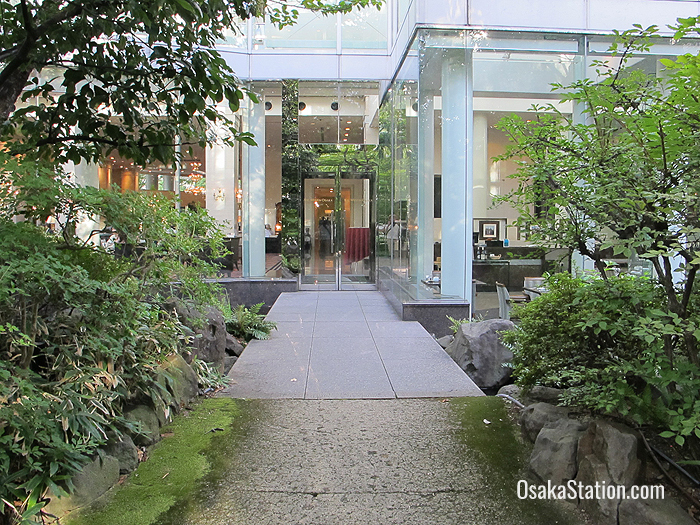 The restaurant looks out onto the “Chushizen-no-mori” forest garden. Imperial Palace is a stylish Michelin-starred Chinese restaurant serving traditional Cantonese cuisine. Hanano is an elegant Japanese restaurant decorated in a traditional sukiya tea-house style which serves sushi, teppanyaki, tempura, and sukiyaki. Blue Bar is a candle-lit executive bar with plush furniture and chandeliers. The Lobby Lounge serves coffee, tea, cakes, pastries, and British style afternoon tea sets. Light meals and sandwiches are also available. 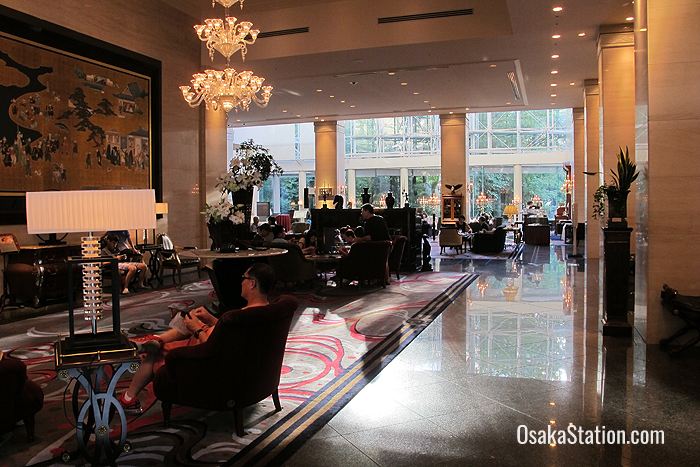 The Westin Osaka has a 24 hour reception desk, a concierge service, and English speaking staff. The hotel fitness center has a fully equipped gym, indoor swimming pool, a large Jacuzzi, sauna, massage room, and outdoor running track. In addition to a massage salon, this hotel also has an acupuncture salon on the 6th floor. A childcare room is available for younger children from Monday to Friday. 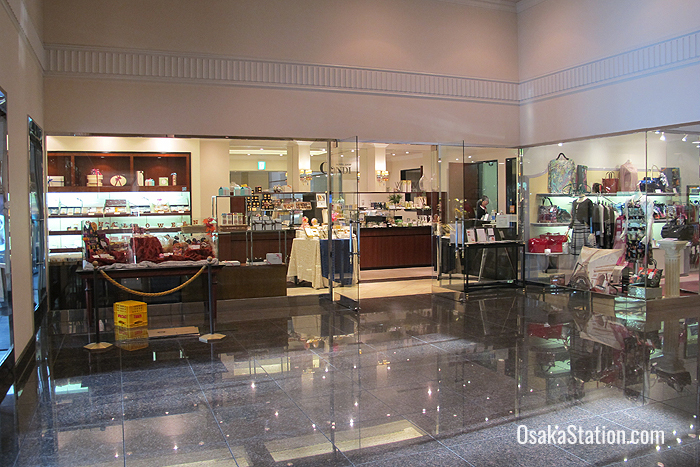 The gift shop Condi sells cakes, confectionery, cut glassware, and aromatic toiletries, candles and incense. This hotel also has a flower shop, a photography studio, and a hair salon. 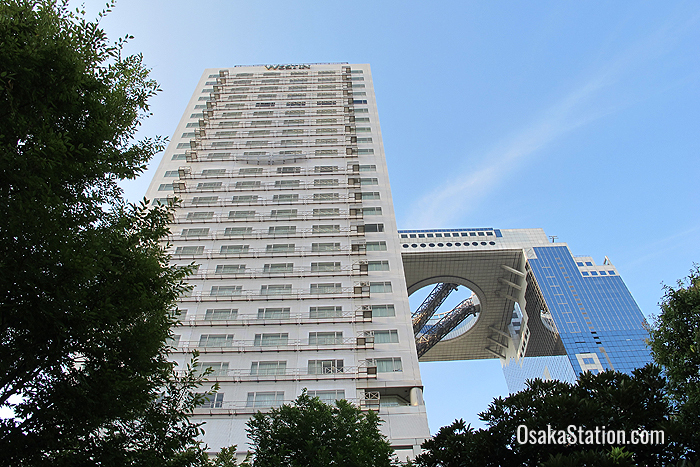 The Westin Osaka stands beside the Umeda Sky Building in an area to the north of Osaka Station. From Osaka Station’s north central exit it is an 11 minute walk, however, there is a shuttle bus between the hotel and the station.